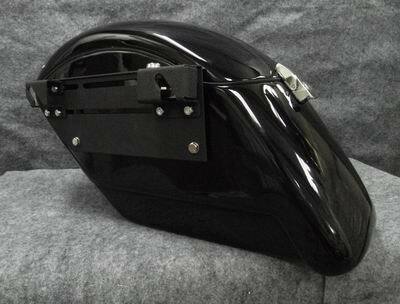 "Easy Strong" Hard Saddlebags are new design of "Strong" saddlebags to fit with Ghost brackets or Easy brackets. With flat back furface, you may install Ghost brackets or Easy brackets to where you want. 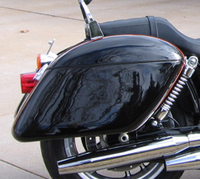 Ghost Brackets / Easy Brackets are a quick release saddlebag system that allows you put on or take off your saddlebags in roughly two seconds! "Easy Strong" Hardbags has identical shape and dimension as regular "Strong" Hardbags, but with different lids and back face, it is modified from regular "Strong" Hardbags so that it has a flat back surface for installing Ghost Brackets / Easy Brackets, and allow you to installing the brackets as high as possible on the Hardbags, that means, you may install the HardBags as low as possible on you bike. Options of finishings for "Easy Strong" hardbags are ready to paint (primer), gloss black, one tone color match or vinyl covered. Find Photos of your bike with "Easy Strong"
Amber in color. Color can be changed into Red based on request. Please send us email for this request. -Ship seperately direct from Easy Brackets. There will be 15% restocking fee and shipping cost cannot be refunded if return for refund. *Each color-matching is for one set only. If you order two sets, you have to order two color-matchings.